In this Huffington Post blog, Lucy Bell asks what we can learn from cartonera publishers and their creative, imaginative and constructive responses to challenging social, political, economic and environmental conditions, In particular, she argues, that cartonera publishers, working principally in the global South, offer valuable socio-aesthetic models that might be of interest to practitioners and academics working on, and for, social change – not only in Latin America, but also in the supposedly ‘developed’ world. In the UK, we have a history of treating so-called ‘developing’ and even ‘newly industrialized countries’ as charity cases, regarding places that are thus labelled as ‘needing our help’, whether economic, social or environmental. As for Latin America, the news we read about it in the papers largely consists of sporadic, sensationalist stories: Zika, drug-related violence and disappearances, swine flu, the Chilean miner accident, and so on. Only if we go (literally) out of our way to spend time in Latin America, read more widely about it, or follow alternative news outlets like Positive News https://www.positive.news/ do we stand a chance of seeing another side to this bleak picture of violence, drugs, poverty and natural disasters. In my current research, I am exploring some of the ways in which people in Latin America respond creatively, imaginatively and constructively to challenging social, political, economic and environmental conditions – in ways that are of great value and interest not only in Latin America, but also in the supposedly ‘developed’ world. A fascinating example of such creativity is the recent emergence of editoriales cartoneras (‘cardboard publishers’, or ‘waste-picking publishers’): small, independent publishers that make their books out of recycled cardboard, either bought from cartoneros (waste pickers) at a price above market rates or collected by the publishers themselves. The basic idea is that books are made by hand from found or recycled materials, painted, decorated or ‘intervened’ through collage work, and sold at prices lower than those of large publishing houses. 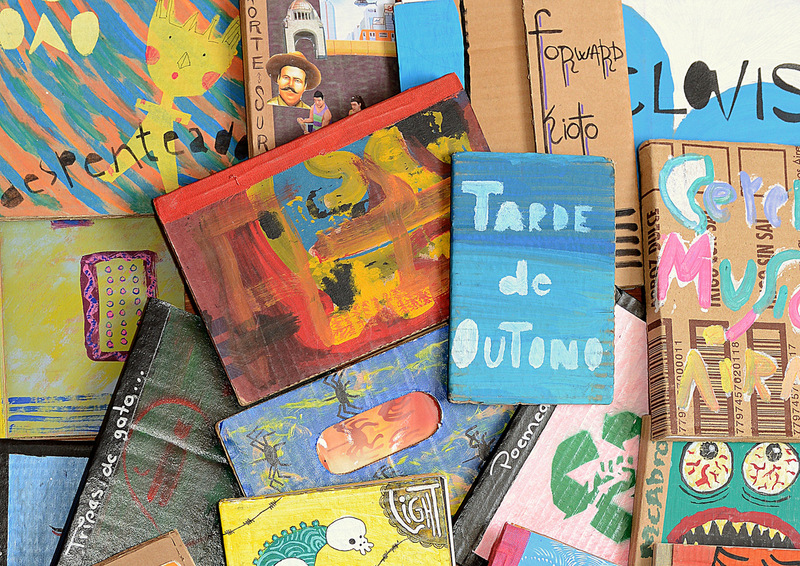 The cardboard publishing movement first began in Buenos Aires in the wake of the 2001 economic crisis, during which unemployment rates soared and thousands of people suddenly found themselves homeless. One of the most visible impacts of this deep recession was the appearance of thousands of cartoneros, who took to the streets to collect scrap materials to sell on to individuals or recycling companies. 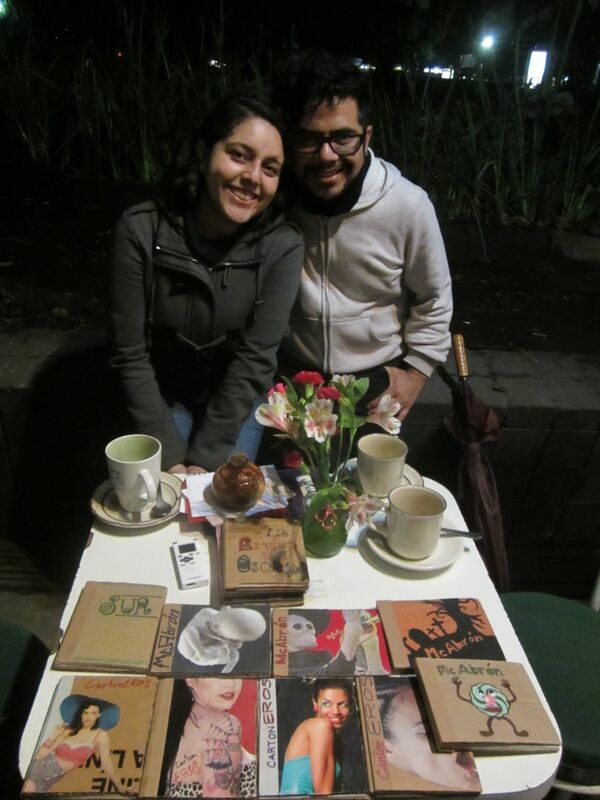 In 2003, the founding members of the first cardboard publisher, Eloísa Cartonera (including the now well-known writer Washington Cucurto) began buying cardboard from the cartoneros at five times its market value to produce hand-painted books. Since then, the movement has spread widely across and beyond Latin America, in Chile, Peru, Colombia, Brazil, Mexico and more, and as far as Sweden, France and Mozambique. The publishers’ shared identity as cartoneras conceals a vast array of s of tructures, processes, catalogues and aspirations. Some work in groups in a workshop space, others work individually or as a pair (often a couple) from their own homes. Some carry out the work alongside study or work, others (try to) make a living out of it. Some publish literary texts, while others publish political or philosophical essays, or even collections that span literature, the visual arts, history, philosophy, and more. The social aims of the projects also differ widely: some (like Eloísa Cartonera in Buenos Aires and Dulcineia Catadora in São Paulo) retain strong links with waste-picker collectives; others (like Pensaré Cartoneras, https://pensarecartoneras.wordpress.com/ a ‘nomadic’ publisher that has been based in San Cristóbal, Mexico and Valencia, Spain, and is continuing to move) focus on different social angles, working with school children in disadvantaged communities or local immigrant communities; others still are principally interested in disseminating their catalogues to wider, or marginal, audiences. The movement was effectively born from, or at least triggered by, a deep economic crisis in Argentina. In Europe, the 2009 economic crisis persists, and – though it is felt most acutely in countries like Greece and Spain – continues to affect the UK on many levels, especially due to government funding cuts in welfare, education, the arts, and so on. In this context, it is encouraging and inspiring to see the ways in which individuals and collectives have responded, and continue to respond, to economic hardship and precarious working conditions in ways that not only have the potential to transform lives by creating small pockets of income, but also transform prevailing attitudes. In the case of cartoneras, the publishers challenge widespread perceptions of waste, and corresponding prejudices about the often invisible people associated with it – known in this country, tellingly, as ‘bin men’, ‘scavengers’ and ‘tramps’. Though widespread throughout Latin America, editoriales cartoneras are very small-scale, in terms of the size of the projects, the number of publications, their print runs and their reach within the community. Yet, as Aurelio Meza puts it http://www.radiadormagazine.com/2014/04/editoriales-cartoneras-en-mexico.html, they offer us a view of ‘how things can be done differently’. Though they do not displace or disrupt the dominance of transnational publishing corporations, they highlight alternative practices based not on competition and profit, but on cooperation and friendship. They constitute what Guattari calls ‘microscopic attempts’ on a community level to bring about social change (1984). Cardboard publishing is a dispersed, fragmented movement, but one of the few things that unites these publishers is the practice of creative recycling, or ‘upcycling’. For some, the environmental implications of their publishing activities are merely tangential; for others they are absolutely crucial. The Brazilian Dulcineia Catadora, for example, is a publishing cooperative in which artist/translator Lucia Rosa works alongside waste pickers from a Sao Paulo-based recycling cooperative, and the publishing workshop is based in a recycling plant underneath a highway flyover in the Liberdade area of São Paulo. Some of their projects have involved collaborations with local environmental projects. When I met the members of Dulcineia in 2014, I was astounded by the positive and creative take on sustainability by this community – a term that for them is tantamount to survival, to feeding and clothing themselves and their children.